From Butler, at the intersection of Business Highway 71 and County Highway H, go east 9 ½ miles, turn left (north) on gravel road (county road # 9003) and go1 ¼ miles, turn left (west) on gravel road (county road # 4254) and go 1/8 mile. Cemetery is on north side of road. 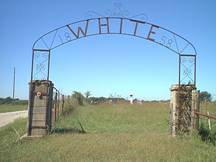 White Cemetery’s first burial was Kiturish White in 1859 on his father’s farm. It became a public cemetery later.